The story of oil is one of hubris, fortune, betrayal, and destruction. It is the story of a resource that has been undeniably central to the creation of our modern culture, and ever-present during the darkest exploits of empire the world over. For the past 150 years, oil has become the most essential ingredient for economic, military, and political power. And it has brought us to our present moment in which political leaders and the fossil-fuel industry consider extraordinary, and extraordinarily dangerous, policy on a world stage marked by shifting power bases. Upending the conventional wisdom by crafting a “people’s history,” award-winning journalist Matthieu Auzanneau deftly traces how oil became a national and then global addiction, outlines the enormous consequences of that addiction, sheds new light on major historical and contemporary figures, and raises new questions about stories we thought we knew well: What really sparked the oil crises in the 1970s, the shift away from the gold standard at Bretton Woods, or even the financial crash of 2008? How has oil shaped the events that have defined our times: two world wars, the Cold War, the Great Depression, ongoing wars in the Middle East, the advent of neoliberalism, and the Great Recession, among them? 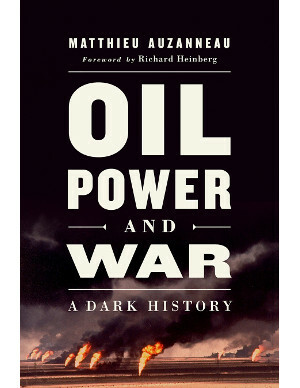 With brutal clarity, Oil, Power, and War exposes the heavy hand oil has had in all of our lives—and illustrates how much heavier that hand could get during the increasingly desperate race to control the last of the world’s easily and cheaply extractable reserves. Published by Chelsea Green Publishing, November 2018. 672 pages. ISBN 978-1-60358-743-3.